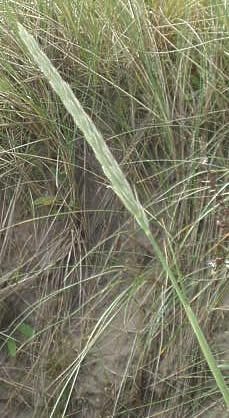 Occasional, in coastal sand or rarely shingle. 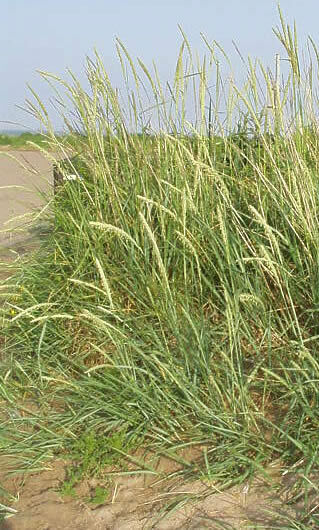 ID: Spikelets alternating up the axis, face onto it like Couch Grass, not edge on like Ryegrass. Differs from Couches in having the glumes longer than the lowest lemmas. Other features: A large robust grass, the bluish-grey leaves with prominent ribs and pointed auricles where the blade joins the sheath. 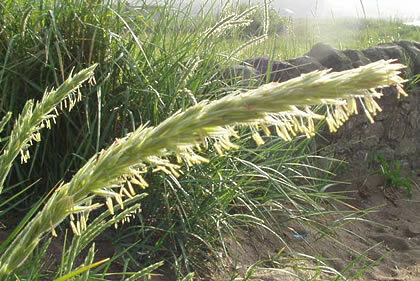 Glumes are long, thin and pointed, almost as long as the whole spikelet, which has 3-6 flowers.